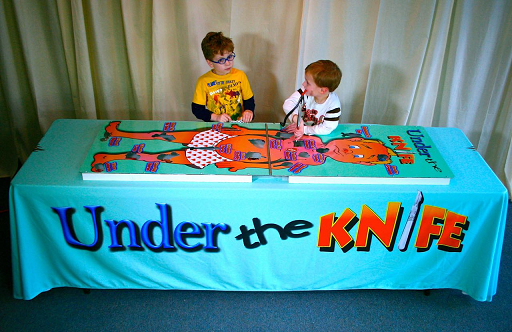 Under the Knife | AZ Jolly Jumpers Party Rentals | inflatable rentals in Litchfield Park, Arizona. 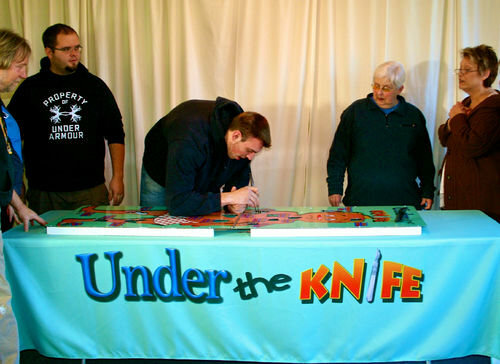 AZ Jolly Jumper's NEW Under the Knife game is great fun for all ages! This over-sized board game is colorful, fun, and an instant classic. Players use the huge tweezers to extract fun parts from the nervous patient. If either the tweezers or the game piece touches the game board... Uh-Oh! The patient's nose lights up and funny sound effects are triggered. It can go anywhere and this surgical game becomes the life of any party or event! Requires three prong power outlet. Includes table, table cloth, game, and peices.